This exhibit features a collaborative work by Adonna & Justin The Artistic Horse painting “Stampede” it is one of several pieces exhibited by city artists. Also on exhibit is “Stampede Art Scarf” a digital reproduction of the original painting. Adonna and Justin The Artistic horse, collaborate to create Stampede, an abstract expressionistic painting. The process involves an unconventional application of paint to create energetic compositions. 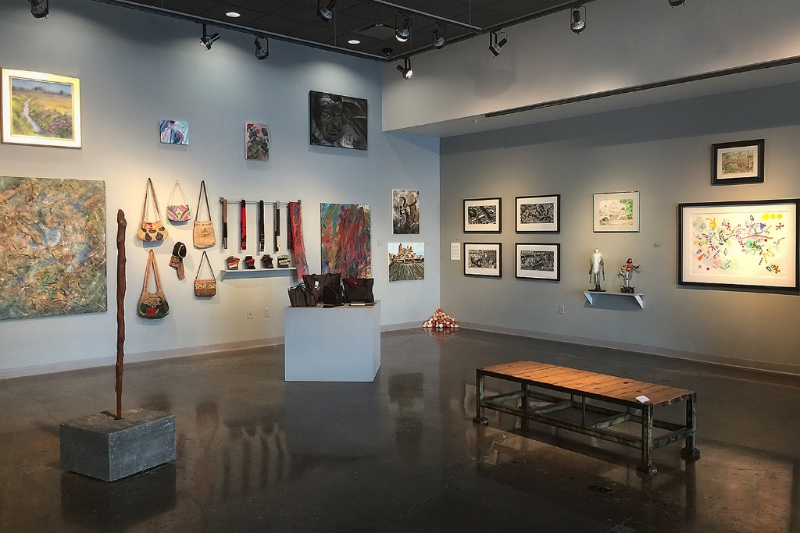 The Indiana University Center for Art+Design current exhibition Columbus Makes is on display until February 13. Columbus Makes invites the Columbus community to exhibit their creations, of any kind and of any making or material, in the IUCA+D gallery, curated by artist Jennifer Riley. These works from within our community will be shown in collaboration with students from IUCA+D Associate Director Marleen Newman’s Vertical Interior Design studio. Professor Newman’s students, working with artist and sculptor Emily Kennerk, will re-purpose plastic material to create new surfaces and a unique context for the exhibition. The Columbus Makes exhibition is open to all who make things: fine art, crafts, and serious hobby items. The handmade, unique, and rare items include sculpture, painting, musical instruments, quilts, photography, furniture, knitting, ceramics, jewelry, clothing, toys, perishable items, and games. This exhibition is curated by Columbus and NYC based artist, Jennifer Riley. Learn more about her work, writing, and curatorial projects at jenniferriley.net. For further information please contact the IU Center for Art+Design at 812-375-7550 or iucadmai@indiana.edu. We invite you to visit our website at http://www.indiana.edu/~iucad. Adonna…..You and JUSTIN the ARTISTIC HORSE have accomplished so much together. Of course Justin is my favorite ARTIST ! ! ! Your entry of “STAMPEDE” adds a bit of greatness to the exhibition. needs types of people etc. Hi Mary, I hope that Linda is enjoying her painting, it was one of my favorites. “Gallopolooza” is a great choice also “Self Portrait” is a best seller and always does well in auctions. Unfortunately I only donate locally. Thank You… Adonna & Justin The Artistic Horse.